According to exit polls conducted by South Korea's three major terrestrial broadcasters KBS, MBC and SBS, the ruling Democratic Party is projected to win a landslide victory in the local elections and parliamentary by-elections held on Wednesday. The DP is predicted to win 14 out of 16 major mayoral and gubernatorial races while the main opposition Liberty Korea Party is expected to win two. The remaining seat is likely to go to an independent. In Seoul, incumbent Mayor Park Won-soon of the DP is expected to clinch a third-term with 55 percent of the votes, beating the LKP contender Kim Moon-soo with 21-point-two percent. In the Gyeonggi Province gubernatorial race, the DP's Lee Jae-myung is forecast to win with 59-point-three percent of the votes while the LKP's Nam Kyung-pil is predicted to win 33-point-six percent. 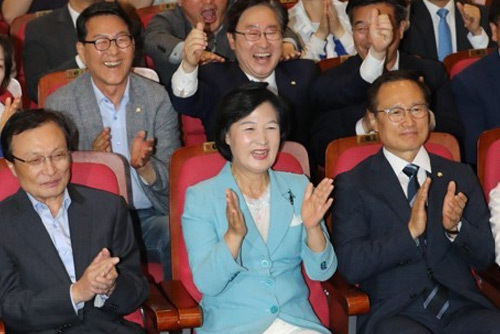 In South Gyeongsang Province, the ruling DP’s Kim Kyung-soo is predicted to beat the LKP’s Kim Tae-ho with 56-point-eight to 40-point-one percent. In the parliamentary by-elections held on the same day, the ruling DP is also expected to win ten seats out of 12 up for grabs with the LKP winning one seat. In the educational superintendents’ elections, progressive candidates are predicted to lead in 13 of 17 races, including in Seoul. The joint exit polls were conducted from 6 a.m. to 5 p.m. on 170-thousand voters at 640 polling stations across the nation. The exit polls did not reflect advance voting held last Friday and Saturday when 20-point-14 percent of voters cast their ballots early. Winners of the elections are expected to emerge by around 10:30 p.m.